As in Waxman-Markey and other bills, the target trajectory is mostly linear. That actually doesn’t make much sense, because it implies a much greater proportional effort late in the game. 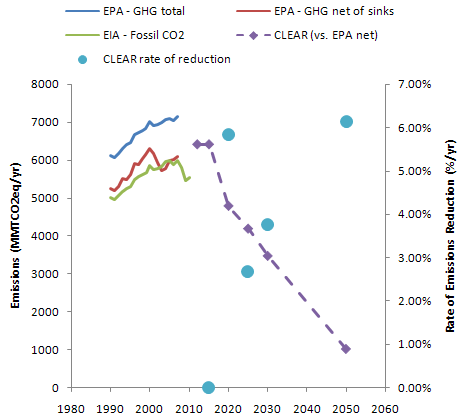 Emissions reductions finish at >6%/year. If GDP growth is 3%/year, that implies a final intensity reduction rate of >9%/year, which is fairly delusional. 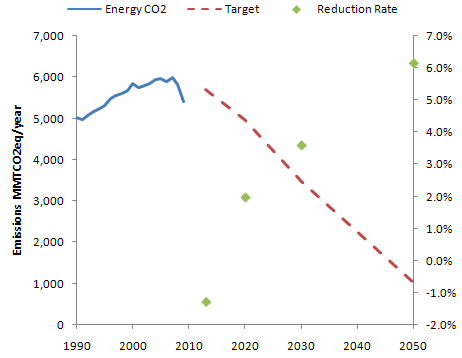 Unlike Waxman-Markey, which is strictly linear, the first three years are flat, then there’s a race to the 2020 target. It’s good to harvest the low-hanging fruit quickly, but the 2015-2020 trajectory seems a little sporty. CLEAR is upstream, covering fuels at the minemouth, wellhead, import terminal, etc. This strikes me as a big advantage administratively and improves coverage as well. Offsets, funded by a set-aside from auction revenues, play a much smaller role, which is OK, because with better coverage there won’t be as big a market. International offsets are also assumed to play a much smaller role (a few % of reductions, vs. roughly half of W-M reductions). That makes the true target trajectory much more aggressive, and raises expected permit prices a lot. Whether this is good or bad is ambiguous; one drawback is that there’s potentially less “carrot” for developing countries, and less funding for forestry. Unlike Waxman-Markey, CLEAR allocates most (75%) permits to citizens as “shares”. That’s bad news for coal-fired electric utilities, but possibly good news for low income residents of coal-intensive areas. My guess is that the totally flat distribution of revenue would more than compensate for regional inequities for the bottom quintile, who would come out ahead. The remaining permits go to a “CERT” fund for worker, business, and community transitions, stranded assets, targeted relief for energy-intensive industries exporting to countries without emissions controls, R&D, offsets and other usual suspects. There’s room for a lot of good here, but also a lot of pork. I think it would make sense to partially phase out the fund in the future, as its revenues would likely rise beyond the need. Like W-M, CLEAR includes a border adjustment (effectively a tariff on the embodied carbon content of imports). This, plus the potential trade measures in CERT, should make labor happy and infuriate WTO partners like China. Strategically, CLEAR seems to leave more of the detailed design of the market and related mechanisms to the executive branch. I think that’s a good thing. It’s impossible to have a sensible debate about a piece of legislation the size of the Oxford dictionary. Add in the fact that this proposal is much closer to economic ideals for a cap & trade (upstream coverage, flat rebates, safety valves) and I’m liking this a lot better than ACES. 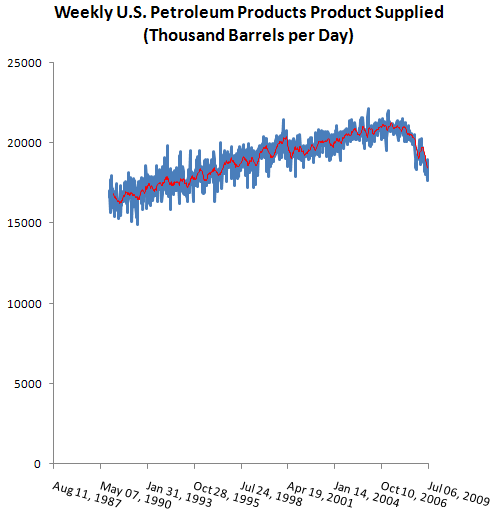 It shows prices for electricity and petroleum from the ADAGE model in the June EPA analysis. BAU = business-as-usual; SCN 02 = updated Waxman-Markey scenario; SCN 06 = W-M without allowance allocations for consumer rate relief and a few other provisions. Notice how the retail price signal on electricity is entirely defeated until the 2025-2030 allowance phaseout. On the other hand, petroleum prices are up in either scenario, because there is no rate relief. 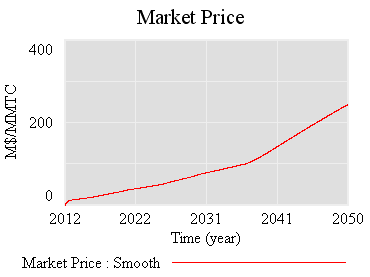 Isn’t it worse to have a big discontinuity electricity prices in 2025-2030, rather than a smaller one in 2010-2015? Is your average household even going to notice a 1 or 2 c/kwh change over 5 years, given the volatility of other expenses? Since the NPV of the rate relief by 2025 is not much, couldn’t the phaseout happen a little faster? How does it help to defeat the price signal to the residential sector, a large energy consumer with low-hanging mitigation fruit? Things might not be as bad as all this, if the goal (not mandate) of serving up rate relief as flat or fixed rebates is actually met. Then the cost of electricity at the margin will go up regardless of allowance allocation, and there would be some equity benefit. But my guess is that, even if that came to pass, consumers would watch their total bills, not the marginal cost, and thus defeat the price signal behaviorally. Also, will people with two addresses and two meters, like me, get a double rebate? Yippee! The strategic allowance reserve would be established by taking a certain percentage of allowances originally reserved for the future — 1% of 2012-2019 allowances, 2% of 2020-2029 allowances, and 3% of 2030-2050 allowances — for a total size of 2.7 billion allowances. Every year throughout the cap and trade program, a certain portion of this reserve account would be available for purchase by polluters as a “safety valve” in case the price of emission allowances rises too high. How much of the reserve account would be available for purchase, and for what price? The bill defines the reserve auction limit as 5 percent of total emissions allowances allocated for any given year between 2012-2016, and 10 percent thereafter, for a total of 12 billion cumulative allowances. For example, the bill specifies that 5.38 billion allowances are to be allocated in 2017 for “capped” sectors of the economy, which means 538 million reserve allowances could be auctioned in that year (10% of 5.38 billion). In other words, the emissions “cap” could be raised by 10% in any year after 2016. 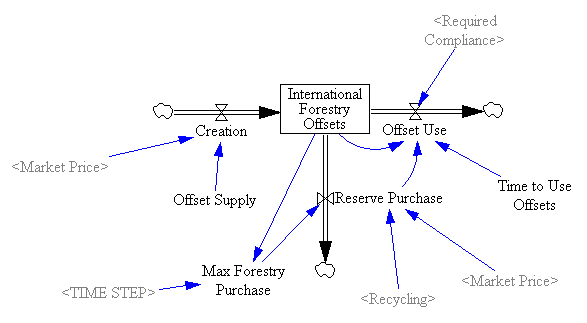 First, it’s not clear to me that international offset supply for refilling the reserve is unlimited. Section 726 doesn’t say they’re unlimited, and a global limit of 1 to 1.5 GtCO2eq/yr applies elsewhere. Anyhow, given the current scale of the offset market, it’s likely that reserve refilling will be competing with market participants for a limited supply of allowances. Second, even if offset refills do raise the de facto cap, that doesn’t raise global emissions, except to the extent that offsets aren’t real, additional and all that. 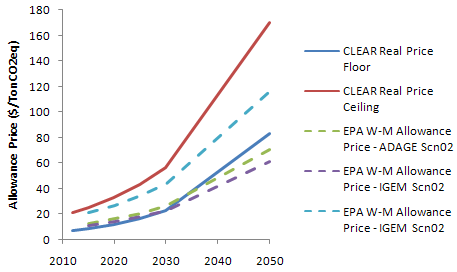 With perfect offsets, global emissions would go down due to the 5:4 exchange ratio of offsets for allowances. If offsets are really rip-offsets, then W-M has bigger problems than the strategic reserve refill. 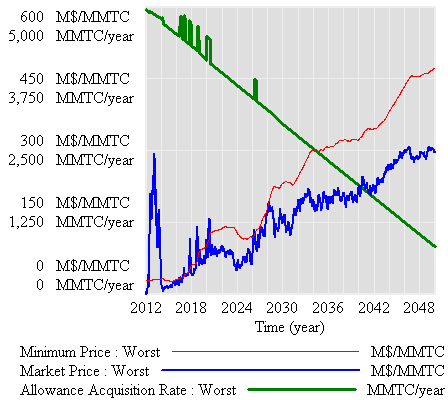 Even with these implausibly high drivers, it’s hard to get a price trajectory that triggers a sustained auction flow, and total allowance supply (green) and emissions hardly differ from from the no-reserve case. My preliminary simulation experiments suggest that it’s very unlikely that Breakthrough’s nightmare, a 10% cap violation, could really occur. 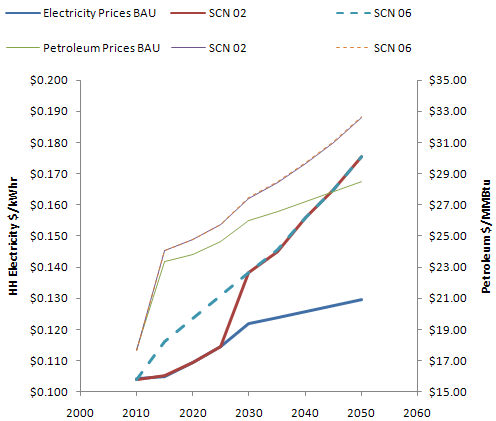 To make that happen overall, you’d need sustained price increases of over 20% per year – i.e., an allowance price of $56,000/TonCO2eq in 2050. However, there are lesser nightmares hidden in the convoluted language – a messy program to administer, that in the end fails to mitigate volatility. Author TomPosted on July 7, 2009 Categories Climate, energy, Models, PolicyTags ACES, cap & trade, cost containment, emissions, HR2454, strategic reserve, volatility, Waxman Markey3 Comments on Strategic Excess? Breakthrough's Nightmare? Model in hand, I tried some experiments (actually I built the model iteratively, while experimenting, but it’s hard to write that way, so I’m retracing my steps). 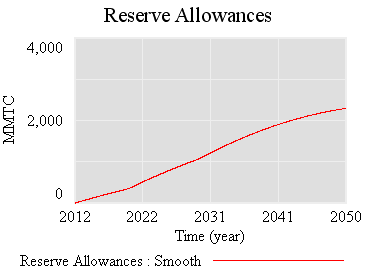 Since allowances accumulate, the de facto cap is 1-3% lower (by the share of allowances allocated to the reserve). Could this happen in reality? I’m not sure – it depends on timing, behavior, and details of the recycling implementation. I think it’s safe to say that the current design is not robust to such phenomena. Fortunately, the market impact over the long haul is not great, because the extra accumulated allowances don’t get used (they pile up, as in the smooth case). 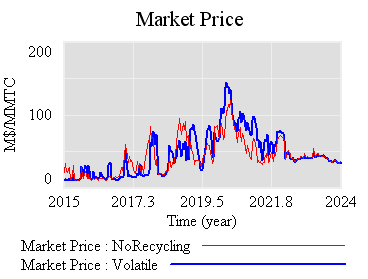 The mean price with the reserve (blue) is actually slightly higher, because the reserve mainly squirrels away allowances, without ever releasing them. Volatility is qualitatively the same, if not worse. That doesn’t seem like a good trade (unless you like the de facto emissions cut, which could be achieved more easily by lowering the cap and scrapping the reserve mechanism). 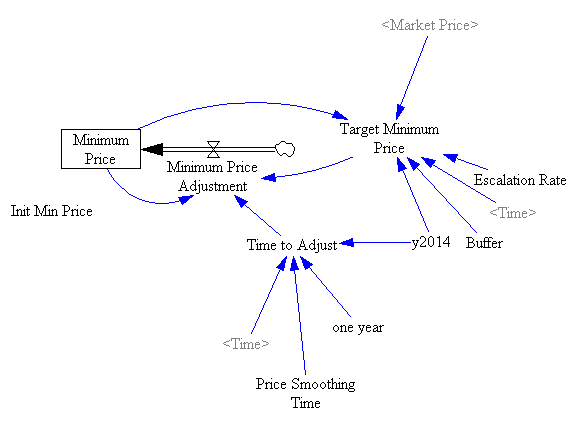 Still, the reserve mechanism seems like a lot of complexity yielding little benefit. At best, it can iron out some wrinkles, but it does nothing about strong, sustained price excursions (due to picking an infeasible target, for example). Perhaps there is some other design that could perform better, by releasing and refilling the reserve in a more balanced fashion. That ideal starts to sound like “buy low, sell high” – which is what speculators in the market are supposed to do. So, again, why bother? I suspect that a more likely candidate for stabilization, robust to uncertainty, involves some possible violation of the absolute cap (gasp!). Realistically, if there are sustained price excursions, congress will violate it for us, so perhaps its better to recognize that up front and codify some orderly process for adaptation. At the least, I think congress should scrap the current reserve, and write the legislation in such a way as to kick the design problem to EPA, subject to a few general goals. That way, at least there’d be time to think about the design properly. It’s hard to get an intuitive grasp on the strategic reserve design, so I built a model (which I’m not posting because it’s still rather crude, but will describe in some detail). First, I’ll point out that the model has to be behavioral, dynamic, and stochastic. The whole point of the strategic reserve is to iron out problems that surface due to surprises or the cumulative effects of agent misperceptions of the allowance market. You’re not going to get a lot of insight about this kind of situation from a CGE or intertemporal optimization model – which is troubling because all the W-M analysis I’ve seen uses equilibrium tools. That means that the strategic reserve design is either intuitive or based on some well-hidden analysis. It’s already complicated, but actually less complicated than the mechanism described in W-M. For one thing, I’ve made some process continuous (compliance on a rolling basis, rather than at intervals) that sound like they will be discrete in the real implementation. Refilling the strategic reserve consumes international forestry offsets, which may also be consumed by firms for compliance. Offsets are created by entrepreneurs, with supply dependent on market price. 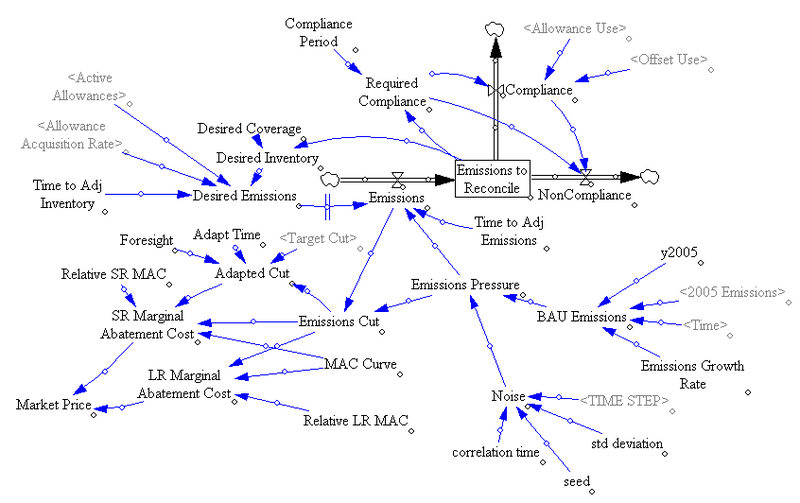 The compliance market is a bit complicated. Basically, there’s an aggregate firm that emits, and consumes offsets or allowances to cover its compliance obligation for those emissions (non-compliance is also possible, but doesn’t occur in practice; presumably W-M specifies a penalty). 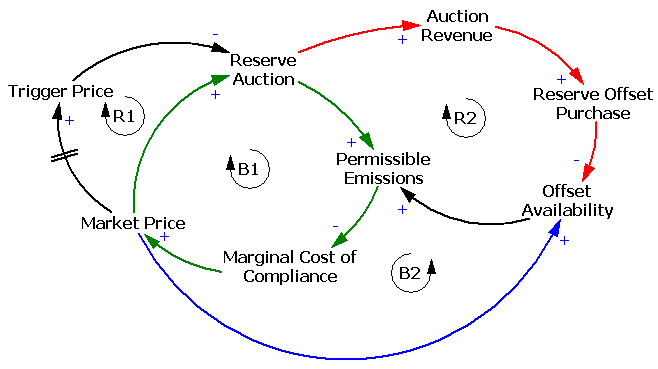 The firm plans its emissions to conform to the expected supply of allowances. 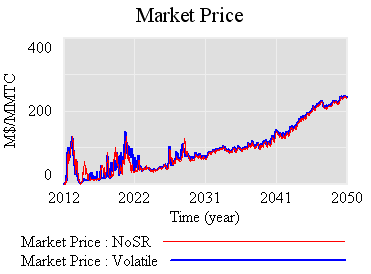 The market price emerges from the marginal cost of compliance, which has long run and short run components. The LR component is based on eyeballing the MAC curve in the EPA W-M analysis. The SR component is arbitrarily 10x that, i.e. short term compliance surprises are 10x as costly (or the SR elasticity is 10x lower). Unconstrained firms would emit at a BAU level which is driven by a trend plus pink noise (the latter presumably originating from the business cyle, seasonality, etc.). So far, so good. Next up: experiments. Before digging into a model, I pondered the reserve mechanism a bit. The idea of the reserve is to provide cost containment. The legislation sets a price trigger at 60% above a 36-month moving average of allowance trade prices. When the current allowance price hits the trigger level, allowances held in the reserve are sold quarterly, subject to an upper limit of 5% to 20% of current-year allowance issuance. To hit the +60% trigger point, the current price would have to rise above the average through some combination of volatility and an underlying trend. If there’s no volatility, the the trigger point permits a very strong trend. 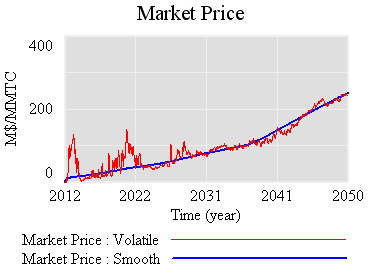 If the moving average were a simple exponential smooth, the basis for the trigger would follow the market price with a 36-month lag. That means the trigger would be hit when 60% = (growth rate)*(3 years), i.e. the market price would have to grow 20% per year to trigger an auction. In fact, the moving average is a simple average over a window, which follows an exponential input more closely, so the effective lag is only 1.5 years, and thus the trigger mechanism would permit 40%/year price increases. If you accept that the appropriate time trajectory of prices is more like an increase at the interest rate, it seems that the strategic reserve is fairly useless for suppressing any strong underlying exponential signal. That leaves volatility. If we suppose that the underlying rate of increase of prices is 10%/year, then the standard deviation of the market price would have to be (60%-(10%/yr*1.5yr))/2 = 22.5% in order to trigger the reserve. That’s not out of line with the volatility of many commodities, but it seems like a heck of a lot of volatility to tolerate when there’s no reason to. Climate damages are almost invariant to whether a ton gets emitted today or next month, so any departure from a smooth price trajectory imposes needless costs (but perhaps worthwhile if cap & trade is really the only way to get a climate policy in place). So, theoretically the reserve might shave some of these peaks, but one would hope that the carbon market wouldn’t be transmitting this kind of noise in the first place. 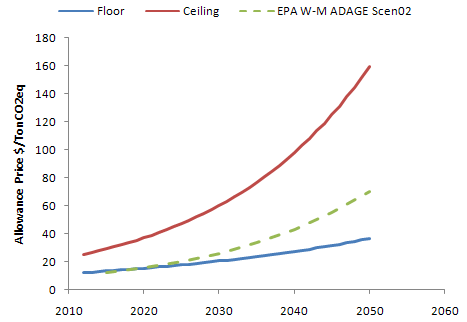 In an effort to get a handle on Waxman Markey, I’ve been digging through the EPA’s analysis. Here’s a visualization of covered vs. uncovered emissions in 2016 (click through for the interactive version). The orange bits above are uncovered emissions – mostly the usual suspects: methane from cow burps, landfills, and coal mines; N2O from agriculture; and other small process or fugitive emissions. This broad scope is one of W-M’s strong points. (A) For vintage years 2012 and 2013, up to 2.0 percent of the emission allowances established for each year under section 721(a). (B) For vintage year 2014, up to 15 percent of the emission allowances established for that year under section 721(a). (ii) the quantity of emission allowances established for 2015 under section 721(a) divided by the quantity of emission allowances established for 2014 under section 721(a). (ii) the quantity of emission allowances established for that year under section 721(a) divided by the quantity of emission allowances established for 2016 under section 721(a). (ii) multiplied by a factor that shall equal 90 percent for 2026 and decline 10 percent for each year thereafter until reaching zero, except that, if the President modifies a percentage for a year under subparagraph (A) of section 767(c)(3), the highest percentage the President applies for any sector under that subparagraph for that year (not exceeding 100 percent) shall be used for that year instead of the factor otherwise specified in this clause. 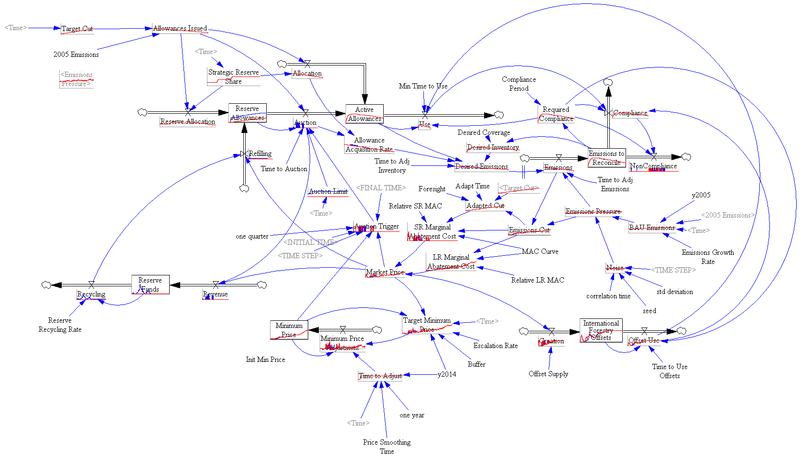 What we have here is really a little dynamic model, which can be written down in 4 or 5 lines. The intent is apparently to stabilize the absolute magnitude of the allocation to trade-vulnerable industries. In order to do that, the allocation share has to rise over time, as the total allowances issued falls. After 2026, there’s a 10%-per-year phaseout, but that’s offset by the continued upward pressure on share from the decline in allowances, so the net phaseout rate is about 5%/year, I think. Oops: Actually, I think now that it’s the other way around … from 2017-2025, the formula decreases the share of allowances allocated at the same rate as the absolute allowance allocation declines. Thereafter, it’s that rate plus 10%. There is no obvious rationale for this strange method. Seems to me that if legislators want to create formulas this complicated, they ought to simply write out the equations (with units) in the text of the bill. Otherwise, natural language hopelessly obscures the structure and no ordinary human can participate effectively in the process. But perhaps that’s part of the attraction?